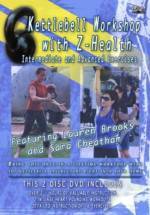 The Kettlebell Body™ is the DVD that you have been waiting for! This one of a kind kettlebell fitness program, instructed and created by Lauren Brooks, is specially designed to fit the needs for any kettlebell experience level and any age! The more advanced you get, the heavier the kettlebells you’ll need to tone and strengthen your body. It’s that simple! The Kettlebell Body™ includes the most intricate and detailed demonstration section filmed yet to help you sculpt a better, stronger body. With The Kettlebell Body™, you’ll start from square one, reacquainting yourself with foundation, movement patterns that set the stage for your kettlebell fitness journey. “Wake Up” More Muscles in Your Body Than Ever! Build Your Strength and Power, Achieving the Kettlebell Body™! Enjoy Lauren’s first DVD, the only ketlebell fitness DVD of it’s kind that solely focuses on movement quality and rep focus as oppose to timed sessions, that features a Kettlebell Body from 4 generations of inspirational, strong, and powerful women. If You Are Looking to Get Strong and Lean for Life, This is it! The Most Comprehensive Video in the Lauren Brooks’ DVD Collection!